Last year, 57 people were killed in traffic on Denver’s streets, and hundreds more suffer life-altering injuries. Per capita, our traffic death rate is twice as high as Seattle’s, and traffic crashes are “the number one cause of morbidity and mortality related to trauma in our community,” according to Denver Health Director of Emergency Medicine Christopher Caldwell. Mayor Michael Hancock says he’s going to change that. Today Hancock announced a commitment by his administration to end deaths and serious injuries on Denver’s streets. 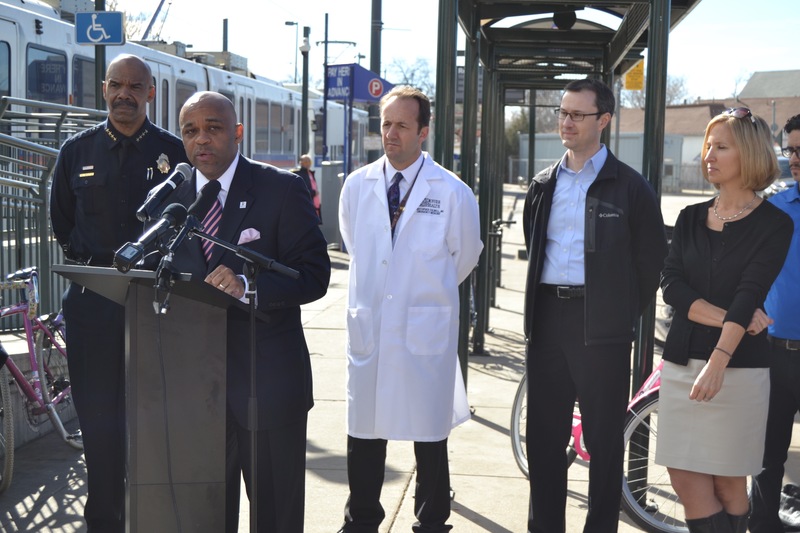 Flanked by some of the city’s top transportation, law enforcement, health, and neighborhood leaders, Hancock stressed an all-hands-on-deck approach to Vision Zero. Hancock did not set a timeline for eliminating traffic deaths, but said benchmarks would come out of the $150,000 action plan being developed by the Department of Public Works and other city departments. The Hancock administration delivered two concrete tools today: An online “dashboard” that maps traffic deaths and serious injuries and details how they occurred, and a bicycle safety plan [PDF] based on a long-awaited bicycle crash analysis. You can also view a list of 2016 “action items,” broken down by city department, on the city’s new Vision Zero website. Ending deaths and serious injuries requires calming traffic so drivers don’t travel at fatal speeds. Other cities have made major progress by focusing on street design and enforcement. “We are making operational and design changes every single day throughout this community to make things better and safer for all users of our roadways, particularly those who are most vulnerable, starting with pedestrians and bicyclists,” said Transportation Director Crissy Fanganello. Police Chief Robert White said his officers will be “more assertive and aggressive” about issuing speeding tickets at high-crash locations, and will work with Public Works as the agency retrofits streets to calm traffic. White, however, also wagged his finger at pedestrians, telling them to cross only at intersections, and he told people biking to follow all the same rules as drivers. Most of Denver’s streets are designed solely to move vehicles, though, and it’s the lack of safe routes for biking that leads a lot of cyclists to break the letter of the law. There’s a lot to unpack following Hancock’s announcement — stay tuned to Streetsblog for more updates. An earlier version of this article stated that the Vision Zero plan would cost $750,000. It has been updated to reflect the actual cost of $150,000.